Being a professional model, the Canon EOS 1D Mark IV provides only the essentials in terms of exposure modes. The modes consist of Program AE, Aperture-Priority, Shutter-Priority, and full Manual mode, along with a Bulb mode for manually timed exposures. The full Auto, Depth of Field AE and various Scene modes found on lesser Canon models are absent. The majority of the exposure modes are fairly self-explanatory, with Program AE, Aperture Priority, Shutter Priority, and Manual modes provide varying degrees of manual and automatic exposure control. While available apertures vary with the lens used, shutter speeds range from 1/8,000 to 30 seconds in all modes except Bulb, which keeps the shutter open as long as the Shutter button is depressed. Interestingly, Bulb mode has no time limit, other than the available charge in the battery. During the bulb exposure, the 1D Mark IV keeps a count of the exposure time in hours, minutes and seconds on its top panel status LCD, and since it's likely to be used at night, Custom Function II-9 allows you to configure the camera to leave the LCD status panels illuminated during a bulb exposure so they can be read, so long as they were lit when the exposure started.. Canon's optional RS-80N3 remote switch and TC-80N3 Timer Remote Controller allow you to take long time exposures without having to hold your finger on the Shutter button. Any of these exposure modes can be individually disabled through Custom Function I-9, preventing accidental use and making it quicker to scroll through the modes you prefer to use. In addition, Custom Functions I-12 and I-13 allow upper and lower limits to be specified for both the shutter speeds and aperture values. 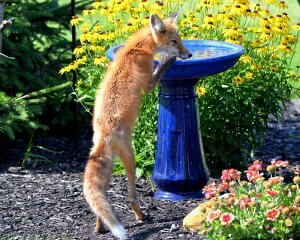 Maximum shutter speeds can be restricted between 15 and 1/8,000 second, and minimum shutter speeds between 30 and 1/4,000 second. Maximum apertures can be limited between f/1.0 and f/64, while minimum aperture limits can be specified between f/1.4 and f/91, and will apply if the physical limits of the individual lens in use extend beyond the manually specified range. Custom Function I-8 can enable a "Safety Shift" option, which automatically adjusts the primary variable (aperture or shutter speed) in Av or Tv modes, if the setting you've selected won't permit a good exposure under the current lighting conditions. This could come into play if you were shooting in shutter-priority mode to achieve a motion-blur effect, but the light suddenly got brighter, pushing the required aperture value beyond what the lens could provide. In this situation, the camera would automatically boost the shutter speed the minimum amount needed to achieve a good exposure. Safety Shift can instead automatically adjust ISO from 100 to 3,200 in P, Av or Tv modes, if so enabled in the same Custom menu (C.Fn 1-8). Alternatively, Safety Shift can be configured to adjust the ISO speed in Program or priority-mode shooting, correcting the exposure while retaining your intended shutter speed or aperture, or the balance between these variables if in Program mode. The Canon 1D Mark IV's exposure metering options, selected using the Metering / Flash Exposure Compensation button, include a 63-zone Evaluative metering mode, Partial (approximately 13.5% of viewfinder at center), Center Spot (approximately 3.8% of viewfinder at center), AF-point Linked Spot (enabled through Custom Function I-7, approximately 3.8% of viewfinder at selected AF point), Multi-spot (a maximum of eight sequential spot meter readings can be entered) and Center-weighted Average options. Metering range is 0 to 20 EV (at 23°C/73°F, with EF 50mm f/1.4 USM lens, ISO 100). Any of these metering modes can be individually disabled through Custom Function I-10, preventing accidental use and making it quicker to scroll through the modes you prefer to use. In addition, the metering mode used to determine the exposure level in Manual exposure mode can be locked to any of the available modes through Custom Function I-11, although by default the 1D Mark IV will use the mode selected via the Metering / Flash Exposure Compensation button. Here you can see the coverage of the 1D Mark IV's metering modes, accompanied by the positions of the 45 autofocus points. From left to right: Evaluative / Center-weighted Average, 13.5% Partial, and 3.8% Spot metering. It's also possible to link the spot meter point to the AF point with a custom function. 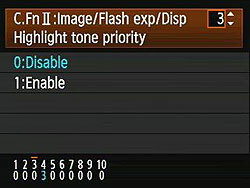 The Canon EOS 1D Mark IV's Exposure Compensation button allows the user to increase or decrease the metered exposure by up to three stops positively or negatively, in one-third or one-half EV increments. (In Program or Priority-mode shooting, the Quick Control dial also acts as an exposure compensation dial by default, whenever it is enabled and the camera's metering system is active.) Should you find that the 1D Mark IV's metering system has a tendency towards under- or overexposure for your particular needs, it is possible to correct for this using Custom Function I-16, "AE Microadjustment". This allows a correction of +/- 1 EV in fine-grained 1/8 EV steps to be applied by default for all shots. It isn't possible to configure different corrections for each individual metering mode, however -- the same correction is applied regardless of metering mode used. 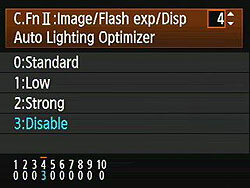 A separate adjustment can be made for flash exposures, using Custom Function I-17, "FE Microadjustment." In Live View mode, evaluative metering is always used, however Canon does not specify how many zones. The sensitivity range for Live View metering is specified at 0-20 EV (again, at 23°C/73°F, with EF 50mm f/1.4 USM lens, ISO 100).When Face Detection AF is enabled in Live View mode, the Canon 1D Mark IV biases the exposure in an attempt to properly expose for a detected face. Courtesy of the dedicated ISO button on its top deck, the Canon 1D Mark IV offers full-stop ISO equivalents of 100, 200, 400, 800, 1,600, 3,200, 6,400, and 12,800, and through Custom Function I-2 also allows use of 1/3-stop ISO settings, adding a further fourteen positions inside this range. The EOS-1D Mark IV also offers low and high-range ISO settings enabled through Custom Function I-3, "Set ISO Speed Range," allowing the lower limit to be extended to ISO 50 (L), while ISO 25,600 (H1), 51,200 (H2), and 102,400 (H3) equivalent positions can be added at the upper end of the range. 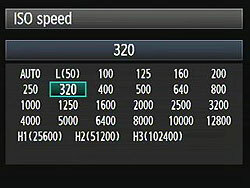 An Auto ISO mode adjusts the ISO as the camera deems necessary, from 100 to 12,800. If operating in bulb mode, Auto ISO is fixed to 400 equivalent. For flash exposures, Auto ISO defaults to ISO 400, but will throttle down as low as ISO 100 to prevent overexposure, and will range as high as ISO 1,600 for bounce flash, if allowed by the Auto ISO limit. Note that ISO 50 is not available when shooting in Movie mode. The Canon 1D Mark IV offers two types of adjustable noise reduction. Long Exposure noise reduction can be performed for exposures one second or longer, and works by taking a second "dark frame" exposure of equal duration with the shutter closed, and then subtracting it from the first frame. This reduces or eliminates most noise generated by the sensor during long exposures at low ISOs, and works for both JPEGs and RAW files, but doubles the time taken to capture each shot, and can make noise worse at higher ISOs (at ISO 1,600 and above). Available settings are Off, Auto and On, and are accessed from Custom Function II-1. The Off setting is the default, and the Auto mode will attempt to automatically detect when this type of noise reduction is beneficial. The 1D Mark IV also offers the user four levels of high ISO sensitivity noise reduction. Options are Standard, Low, Strong, and Disable, with Standard being the default. Though the name implies this noise reduction is only applied at high ISOs, the Canon 1D Mark IV applies it to all ISOs. This explains why the 1D Mark IV's chroma noise in shadows and darker tones is lower than most DSLRs at low ISOs, when using the default Standard setting. If set to Strong, this brings a great decrease in continuous burst shooting performance. High ISO noise reduction is only applied to JPEGs, keeping RAW files as they should be: unprocessed. These settings are accessed in Custom Function II-2. By default, the bracketed sequence captures the metered shot first, followed in turn by frames below and above the metered exposure level. This order can be changed through Custom Function I-5, so that the order is either -, 0, +, or +, 0, -. One final custom function related to automatic exposure bracketing is I-4, which allows the photographer to determine whether bracketed sequences should be continued after powering the camera off, or a new sequence should start once the camera is powered on (the default). The 1D Mark IV retains the simplified AE Lock button from recent Canon models, which unbundles the AF Lock feature from the old button on the older EOS cameras. Marked with an asterisk (*) symbol, the AE Lock button (and its portrait-orientation duplicate) simply holds the exposure at one setting while you recompose the image. It's very useful when spot metering, but also when dealing with subjects where you want to draw your exposure from one place, while autofocusing on another. You may hold the AE Lock button down while depressing the shutter release multiple times to maintain the same exposure across multiple shots. If you release the AE Lock button, the exposure lock is retained for six seconds in regular operation, although this can be changed in one second steps from 0-60 seconds, or 1 minute steps from 1 to 60 minutes, using Custom Function IV-13. In Live View shooting, the exposure lock is retained for 16 seconds, while in Movie mode, it is retained until manually cancelled, which is done by pressing the AF Point Selection button. Through Custom Function I-14, the AE Lock button can instead be configured to instantly recall a preconfigured exposure mode, metering mode, shutter speed, aperture, and/or exposure compensation level while held in. The desired configuration must first be set on the camera, and then registered through the Custom Function menu, after which the saved configuration is instantly recalled whenever the AE Lock button is held down, and the previous configuration returns when the button is released. Optionally, an AF cycle can be triggered simultaneously with the configuration being recalled, when C.Fn I-14 is set and the AE Lock button pressed. In the same manner, it's also possible to use the AE Lock button to switch to a registered autofocus point while held down, using Custom Function III-11. The AF point is registered by first selecting it (or selecting automatic selection, if you want to register this), then pressing the ISO button while holding down the AF Point Selection button. Both functions can be used together, so that a single press-and-hold of AE Lock can recall the shooting mode, metering mode, exposure level, and focus point, then perform an AF operation. Custom Function IV-2 allows the functionality of the AE Lock and AF-On buttons to be transposed, uself if you use the AE lock button more frequently, since the AF-On button location is closer to the grip where your thumb naturally rests when holding the 1D Mark IV body. Pressing the Flash Exposure Lock ("FEL") button (and its portrait-orientation duplicate) with an external flash mounted activates the FE Lock function, which fires the flash and locks the proper exposure for the following frame(s). The FEL button is also used to perform up to eight sequential spot metering readings, when using the 1D Mark IV's Multi Spot Metering function (described previously in the Metering Options section). The Canon 1D Mark IV offers a full range of White Balance settings, including an Auto (3,000-7,000K) setting, six presets, five Custom settings, and a direct Kelvin setting. The six presets include Daylight (5,200K), Shade (7,000K), Cloudy / Twilight / Sunset (6,000K), Tungsten (3,200K), White Fluorescent (4,000K), and Flash (6,000K). The Custom settings base color balance on an exposure, meaning you can snap an image of a white or gray card (or select a suitable previously captured image), and then base the color temperature on that image. Each custom setting can be separately tagged with a twenty character caption, for convenience. The desired color temperature in Kelvin can also be entered directly, from 2,500K to 10,000K, in 100K increments. 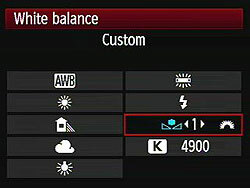 Finally, a Personal White Balance feature allows you to create as many as five different white balance settings on a computer and load them into the Mark IV for quick use. While not quite as flexible as the Custom option, because the Personal settings must be downloaded to the camera from a host computer, it's arguably more powerful, and a great option for pros who have to shoot under highly variable lighting, or for groups of pros needing consistency between their setups. A White Balance bracketing option snaps only one image, but then writes multiple successive files from that single capture. (The default is to write three files, but through the same Custom Function I-6 used for automatic exposure bracketing, this can be changed to two, five, or seven files per captured frame.) Bracketing steps are from -/+ 3 stops in whole-stop increments. (Each stop corresponds to five mireds of a color conversion filter, for a total range of +/- 15 mireds on a three file capture, corresponding to about a +/- 500K shift at a normal daylight color temperature of 5,500K.) White balance bracketed images are captured with the standard image first, followed by the blue and amber-biased, or magenta and green-biased images. Since, depending on setup, two to seven files must be written for each image captured, the white balance bracketing feature can greatly reduce the burst depth in continuous shooting, and it also brings a reduction in burst speed. If white balance and auto exposure bracketing are both enabled simultaneously, it's possible to record as many as 49 separate files from seven frames, in one single bracketed sequence. The Canon 1D Mark IV's WB Bracketing is set on the same grid as the now familiar White Balance Correction control. Fairly sophisticated, the white balance correction tool lets you shift the color balance toward more or less green vs magenta or blue vs amber, using a +/-9 step grid format. You move a highlighted square through the grid to adjust the color balance, and bracketing adjustments spread the single square into a cluster of two, three, five, or seven, depending on the bracketing range configured. As with most other Canon DSLRs, the EOS 1D Mark IV offers a Picture Style option through the LCD menu, which lets you select from Standard, Portrait, Landscape, Neutral, Faithful, Monochrome, or three User Defined settings. In each of the preset modes, the Contrast, Saturation, Sharpness, and Color Tone are set for specific conditions. For Monochrome, Saturation is replaced with Filter effect (options are: None, Yellow, Orange, Red or Green), and Color Tone is replaced with Toning Effect (None, Sepia, Blue, Purple or Green). The three User Defined options let you manually adjust each variable, then save it as a custom parameter. Of course, you can also set the camera's color space to sRGB or Adobe RGB. First seen on the consumer-class Rebel XSi, Canon's Auto Lighting Optimizer (ALO) function lets you expose for the highlights, preserving detail there, while the camera adjusts the image to open up the shadows. This happens on the fly, as the files are being written to the memory card, so there's no post-capture intervention by the user required to take advantage of this function. We weren't terribly impressed with ALO on the XSi, but newer Canon models -- including the 1D Mark IV -- offer four different settings for it, and the control on the 1D Mark IV seems quite effective. The ALO setting is made via Custom Function II-4, where you can select options of Standard (the default), Low, Strong, or Disable. Also included on the Canon 1D Mark IV is Highlight Tone Priority (HTP for short), a feature that's been on Canon SLRs for some time now. It works quite well when dealing with subjects with important detail in strong highlights. (Think of the standard wedding dress shot, and you'll get the idea.) Digital cameras normally expose more like slide film: Once you hit a certain exposure level, detail just vanishes. This really becomes an issue when you're dealing with contrasty lighting and a subject with lots of highlights in it. HTP's action is pretty subtle, but the results are very evident when dealing with strong highlights under harsh lighting. The way it works is to set the camera's base ISO up one notch, to 200, so it's only half-filling the sensor's pixels with charge during the exposure. The Canon 1D Mark IV then alters its tone curve, basically compressing the top half (that would normally be blown out) into a smaller range, thereby preserving the highlight detail. You can do this yourself when working from RAW files, you just need to significantly underexpose most of the scene, and then fiddle with the tone curve to drastically reduce the contrast, but only in the extreme highlights. If that sounds difficult, it is; it can be a real time-sink, and very difficult to make the end result look natural. Canon's HTP does this for you automatically, though, and the results look just great: You have no sense that the camera has been making radical adjustments to its tone curve; you just see all the detail in the highlights that otherwise would be missing. HTP is controlled via Custom Function setting II-3, giving you options to Disable (the default) or Enable it. The Canon EOS 1D Mark IV's Continuous Shooting modes are accessed via the AF / Drive button, and rated by Canon at ten frames per second in high speed mode, for a total of up to 121 Large JPEG (Quality 8), 28 RAW or 20 RAW + Large JPEGs frames before the buffer fills (at ISO 100, using the Standard picture style, and writing to a 16GB UDMA Mode 6 CompactFlash card). When shooting JPEGs of a very complex scene with a lot of sharp, fine detail may also compress less and result in lower buffer capacities, as was seen in our testing. You can specify the maximum burst rate in Continuous High mode between two and ten frames per second, and between one and nine frames per second in Continuous Low, using Custom Function III-18. 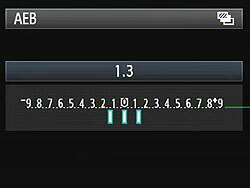 You can also limit the burst depth (number of shots) in Continuous mode from two to 99 shots, through Custom Function III-19. The Canon EOS 1D Mark IV's Drive setting also accesses two Self-Timer modes, which open the shutter 10 or 2 seconds after the Shutter button is pressed. The 10-second setting gives you time to dash around in front of the camera, while the 2-second setting is useful for tripping the shutter without touching the camera, to minimize camera shake.. There is also a Mirror Lockup function, Custom Function III-17, to avoid camera shake due to mirror-slap. The mirror is raised by pressing the Set button, and can either drop immediately that the exposure has been completed, or remain up until the Set button is pressed a second time. Canon's wired RS-80N3, and TC-80N3 remote control units, as well as any N3-type terminal equipped EOS accessory, are supported by the 1D Mark IV. Finally, the 1D Mark IV offers a Silent Single shooting mode which, as the name implies, is a single shot mode that reduces operating noise. It works by spreading the shutter sounds out, holding the mirror up until you release the shutter button, and reducing the speed at which the mirror is lowered post-exposure. The net result is a fairly quiet operation that should prove helpful when photographing wildlife, so long as you're willing to limit yourself to shooting a couple of frames per second or less. Not sure which camera to buy? Let your eyes be the ultimate judge! Visit our Comparometer(tm) to compare images from the Canon EOS-1D Mark IV with those from other cameras you may be considering. The proof is in the pictures, so let your own eyes decide which you like best!